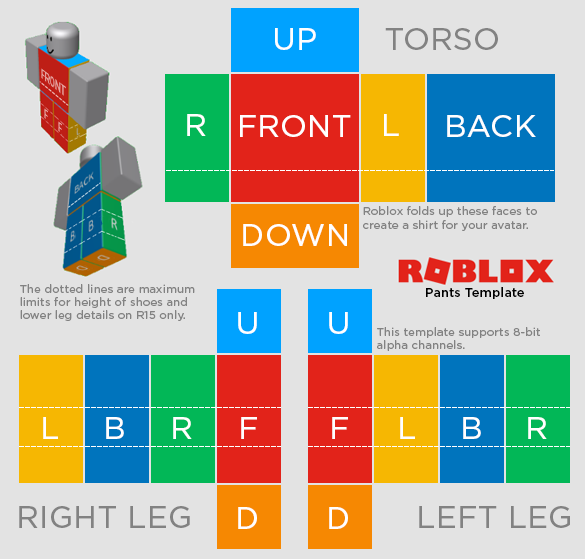 This article outlines how to make avatar pants and shirts, either for yourself or to sell in the Roblox catalog. The easiest (but most limited) clothing design is a t-shirt which is basically an image that gets applied to the front of an avatar’s torso. 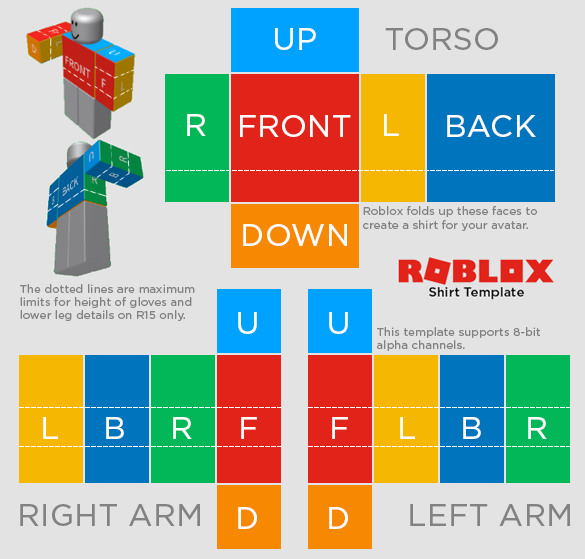 To make a t-shirt, create an image (ideally 128×128 pixels) and then upload it to Roblox as outlined below. Unlike t-shirts, shirts and pants wrap all the way around an avatar’s body, giving you more control over your designs. To get started, you can use our clothing templates and draw your own art on top. Right-click these images and select Save Image As… to save the templates to your computer. Open the templates in an image editor. You can use whatever image editing program you like; some free options include GIMP and Paint.NET. When applying clothing to /articles/r6 vs r15 avatars|R15 avatars in Roblox, some limits exist with the templates. Here are a couple examples of how you should and should not design the shoes on a pants template. In this example, the shoe designs are placed near the bottom of the leg regions (L, B, R, F) but don't extend too far up. This provides a nice separation between the shoes and the bottom of the jeans. Here, the shoe designs extend too far up the leg regions (L, B, R, F) which make them appear as if they're part of the pants. The same issue may occur near other joints on the avatar's body. Some avatars like Circuit Breaker do not accommodate clothing, by design. For shirts and pants, the uploaded image must be the exact dimensions of the template — 585 pixels wide and 559 pixels tall — or the upload will fail. Once you’re done with your design, you need to upload it to Roblox. Save your template file. Note that you can use 8-bit alpha channels for transparent regions. Go to the Create page. Click on the My Creations tab. Click on either Shirts, Pants, or T-Shirts in the left column, depending on your design. In the main area of the window, click Choose File to select your template file. Type in a creative name for your item. Click the Upload button. Once approved by Roblox, the item will show up as one of your creations and can be applied to your avatar or offered for sale to other Roblox players.